A lot of banks would have you think that offering “free” checking is some great favor. Plus, most still charge monthly fees if you don’t maintain a minimum balance. At LMCU, free checking is our starting point. And if you’re willing to handle just a few easy activity requirements, our Max Checking account will pay you a full 3% APY* on balances up to $15,000. 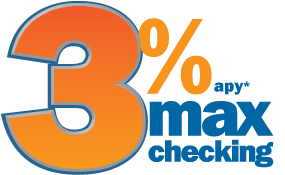 Free Checking and 3% Max Checking: No fees. No minimum balance. It’s a no-brainer. *APY = Annual Percentage Yield. Interest not paid on balances over $15,000. Refunds up to $15 per month in ATM withdrawal fees at non-LMCU ATMs when you withdraw from your Max Checking account. Rate subject to change. To earn 3% APY, simply meet the following monthly requirements: 1. Direct deposit into your Max Checking account. 2. Minimum of 10 debit card purchases. 3. Minimum of 4 logins to home banking. 4. Sign up to receive eStatements/eNotices.